The European Court of Justice has ruled that Israeli goods made in Jewish settlements in the occupied West Bank cannot be considered Israeli. This means goods made by Israelis or Jews in the West Bank cannot benefit from a trade deal giving Israel preferential access to EU markets. EU import duties on Israeli goods from the settlements may now be imposed, making them less competitive. Jewish settlements in the West Bank are illegal under international law. The EU has agreements with both Israel and the Palestinians that end customs duties. Israeli companies based around settlements manufacture a host of products including confectionery, wine, cosmetics and computer equipment. Some of the companies employ Palestinian workers, who are restricted from working in Israel. Palestinians have long argued that Israeli goods made in settlements should not receive trade privileges, as settlements are not part of Israel. 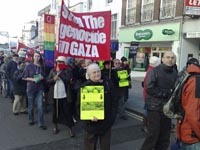 Pro-Palestinian campaigners have also regularly protested that European supermarkets stock goods with Israeli labels on farm products from the West Bank. Israel has yet to formally comment on the court ruling. "The European Union takes the view that products obtained in locations which have been placed under Israeli administration since 1967 do not qualify for the preferential treatment provided for under [the EC-Israel Agreement]," the judges said.